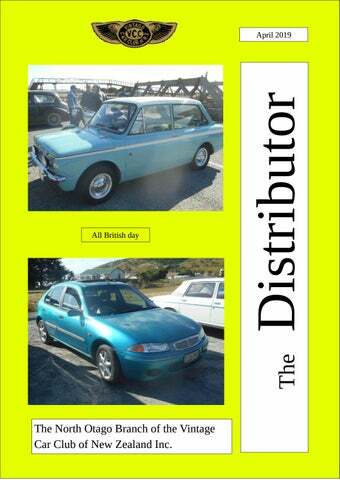 The North Otago Branch of the Vintage Car Club of New Zealand Inc.
From the Committee Guest Speaker for next club night will be Les Gardner to talk about his cars 10 Members turned up for the working bee, trees trimmed parts sorted, cups polished. Entries coming in for Lynch Blosse Motor Cycle rally. AGM coming up positions vacant Secretary, Treasurer Club Captain, etc think about standing and take part in running the club. 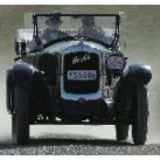 South Canterbury Mid Island Rally Two North Otago VCC members attended the South Canterbury Mid Island Rally on 10th March 2019, with Gordon and Joy Hay in their 1915 Studebaker SPA and John Adamson and Wanda in the 1968 Hillman Imp. There were 57 cars entered. The weather was good for a Rally and the run till lunch time was a timed trial with a set speed of 22.5mph. This was an interesting speed to try and maintain but as a large part of the run was around the streets of Timaru there was little chance of speeding. The navigator was kept busy with left, right and straight through or "take the 2nd exit at next roundabout" instructions. No time to look at the architecture of the houses or the gardens. The A route took the vehicles through Timaru and then westward to circle back to the south of Timaru finishing at the Timaru Botanical Gardens for lunch. There were many beautifully restored cars and all owners could be proud of the display they provided for some members of the public to view. As usual overheard was a "grumbler' who stated that driving round the streets was not a rally in his opinion. Was this because he could not achieve the 22.5mph or did his navigator get them lost?? The North Otago participants really enjoyed the experience. Perhaps a certificate for the best navigator would have been in ordered this time. After a leisurely lunch it was time for the field tests. These were very interesting but still included the dreaded quoits for both driver and navigator. (Never was any good at throwing things to hit a target!) The afternoon run headed out to Pareora Valley by various back roads and on to Cave, where the poor shop keeper was inundated with people stopping for an icecream. The look on his face was a picture as his door buzzer kept pinging with more people entering and lining up. Eventually the vehicles arrived at the Golf Course which was our venue for the prize giving and meal. Special presentations were made for two 50 year badges and one 60 year badge, the recipients being piped into the room with due ceremony. North Otago Members were successful in gaining certificates no actual trophies were presented as appears to be happening with most clubs (good! no polishing the silver ware) Gordon and Joy in the Veteran Class gained 2nd place in the Field Tests and John and Wanda in the Post 60 class were 1st in the field Tests and Best Post 60 vehicle. The journey home was completed in rain which had held off until after the prize giving. An enjoyable outing with great camaraderie. Great day and huge turnout. entry fee for Amberley St. John & Waiau school (small country school) which was damaged in the kaikoura earthquake. put on stalls & food as way to raise funds for their new pool. All British Day. (North Otago) I would like to thank all those who helped to make the day a success, especially Bev and Peter Rodwell, the owners of Elderslie. $490.00 in total was donated to the Salvation Army here in Oamaru, we were assured that it would be spent in the Oamaru community. Picture of the presentation of the cheque to Major Kathy Garbett by our Chairman Gilbert Ellory and the organizer of All British Day yours truly. Thank you all. Clive. Adventures of an Old Restorer. It was good to see Peter's Morris 8 special at the last club night, he has made a great job of it, I particularly liked the 'boat tail' rear end and the wood work, thank you Peter for bringing it along. My Morris 8 project is at last taking shape. After spending so much time on her and seemingly not getting anywhere, I think I can at last see the light at the end of the tunnel, and I no longer think that is a oncoming train! After four coats of primer and a lot of rubbing down, what a tedious job that is, I have at last put the final coat on the Morris, it's a Red from the 1940's, the only difference is that the mudguards are red as well. I watched a video from a Club in Northland, there was a Morris 8 sports shown with the same colour scheme, we thought it looked good, although I was still not convinced right up to spraying the red, but now that it is finished I am. The car will have a black vinyl roof, so there will be plenty of black. Have secured the rear bumper, and attached the winkers to it, the original round rear light has been resurrected and now illuminates the rear number plate, there is also a stop light in it. It has been a mostly a labour of love, so to speak, but there have been times when I have wondered what I have got myself into, I think Jen sums it up.... "What else would you do in your retirement?" All the best, Clive.